Your film journey will not be complete until you’ve seen a Buster Keaton comedy. The Great Stoneface was—along with Gene Kelly and Bruce Lee—one of the best athletes in the history of the movies. He was a daring stuntman who would perform his own stunts AND those of other cast members. In The General (as in so many of his great silent comedies), Keaton was the auteur who wrote, directed, produced, edited and starred as Johnnie Gray. He probably served lunch and pulled focus too. 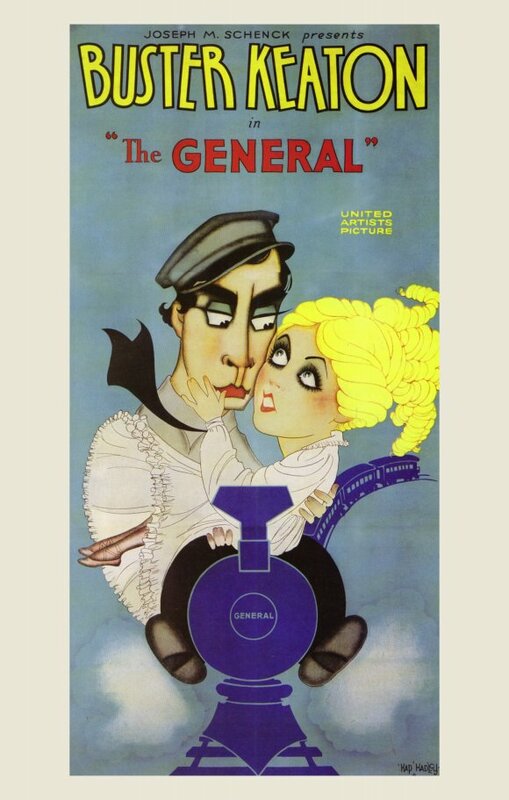 The General is the story of a man and his train…and to a lesser extent, a man and his woman. When Annabelle (Marion Mack) rejects Johnnie for not being in the Confederate Army (which is only because they tell him he’s too valuable as an engineer), he goes back to his first love. Along the way, he gets caught up the Civil War anyway and does what he can to thwart the North on a critical set of railroad tracks. Hilarity frequently ensues. The movie does have some ethical problems. When Annabelle ends up on Johnnie’s train, they DO make a good team, but that doesn’t stop him from getting abusive with her. He practically throttles her. Plus, the movie asks us to side not only with the South during the Civil War, but with the losing side. I don’t back losers! You’re lucky your calm resourcefulness is so charming and likable, Buster. The General is almost a Die Hard movie where one ordinary outnumbered man battles an irresistible force and he just keeps surviving. Better yet, Keaton comes up with some of the best physical comedy of all time, performing some of the greatest stunts you’ll ever see on a moving train. Those must be at least 2 reasons the American Film Institute placed it 18th on their 2007 Top 100 list after not ranking it at all in 1998. They were onto something in ’07. The General overcomes any criticisms. It’s dynamite! For more, check out our audio thoughts on The General in the podcast section!